Ill. Ronald Armbrust Seale, 33°, having been elected Sovereign Grand Commander by the Supreme Council, 33°, on October 3, 2003, was officially installed as Sovereign Grand Commander on October 7, 2003, during an Executive Session of the Supreme Council, 33°, in the House of the Temple, Washington, D.C. Ill. Fred C. Kleinknecht officially retired as Sovereign Grand Commander during the same Executive Session of the Supreme Council, 33°. Ill. Seale’s service on the Supreme Council began with his appointment as Deputy in Louisiana effective January 1, 1995. He succeeded Ill. D. Walter Jessen, 33°, who retired as S.G.I.G. in Louisiana on December 31, 1994. Then on October 8, 1995, Ill. Seale was elected S.G.I.G. in Louisiana and crowned an Active Member of the Supreme Council, 33°. Ronnie, as he is called at home, was born on June 24, 1948, and attended the public schools in Baton Rouge and graduated with a B.A. from Louisiana State University in 1970 and with a Juris Doctor from Cumberland School of Law, Samford University, in 1973. He entered law practice (general and civil litigation) in Baton Rouge in 1974 and is a member of the American Bar Association, Louisiana State Bar Association, Baton Rouge Bar Association, and International Association of Defense Counsel. A life-long member of the First United Methodist Church of Baton Rouge, Ill. Seale was active for over 30 years as a teacher of adults and youth in Sunday School. He previously served as Youth Coordinator in his church and as a delegate to the Louisiana Annual Conference of the United Methodist Church. Grand Commander Seale and his wife, “Sunny” take great pride in their children, Michael and Stephanie. Michael is involved in the Music Industry and performs singing and playing his guitar using original materials. Stephanie is married and is the mother of the Grand Commander’s Pride and Joy, Granddaughter Morgan. “Sunny”, whose real name is Saundra, taught physical education in Baton Rouge, Louisiana, for 30 years. Much of her energy during that time was devoted to the organization and coaching of a competition and performing rope-skipping teams that fostered heart-healthy activities and skills. Her teams won many competitions and traveled all over the world. Ill. Seale began his Masonic career in 1962 as a member and then Master Councilor of Pelican Chapter, Order of DeMolay, in Baton Rouge. He is a Past Chapter Dad of Pelican Chapter, and an Active Member of International Supreme Council, Order of DeMolay. Raised a Master Mason in 1969 in East Gate Lodge No. 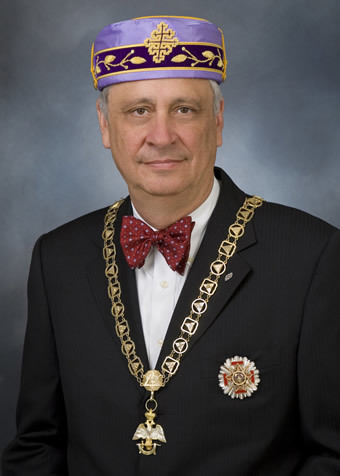 452, Baton Rouge, Louisiana, Ill. Seale served his Lodge as Master in 1988 and served the Grand Lodge of Louisiana as an Appointed Officer and several times as a member of the Law & Jurisprudence Committee. In the Baton Rouge Scottish Rite Bodies, Ill:. Seale was active in several of the Degrees, including the 5th, 27th, and 31st Degrees. For his many services, he was invested with the rank and decoration of Knight Commander Court of Honour in 1977 and coroneted a 33° Inspector General Honorary in 1993.